Absolute effervescence. This is the feeling that comes to mind when I think of Gene Kelly’s musicals. 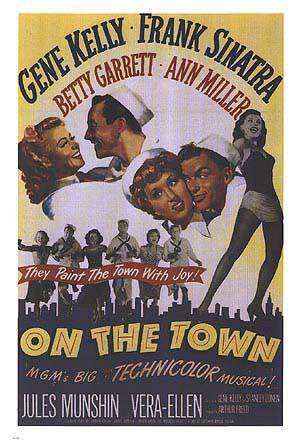 Add in Frank Sinatra and the city of New York, and you have one of the greats: 1949’s On the Town, co-starring Jules Munshin, Ann Miller, Vera-Ellen, and Betty Garrett. Carrie can speak a bit more fervently about this film, and the other two Kelly-Sinatra collaborations, than can I, but I’ll try to match her enthusiasm. 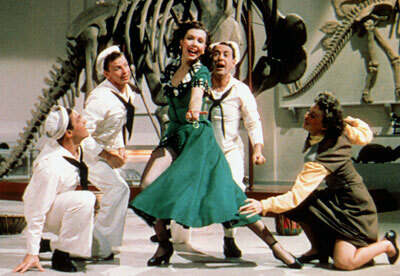 Of the three, which also include Anchors Aweigh (1945) and Take Me Out to the Ballgame (1949), I prefer the joys of the earlier film, including its celebrated centerpiece, Kelly’s dancing duet with Jerry Mouse. But On the Town has its charms, and they are many. The story revolves around the romantic adventures of three sailors on leave in New York for twenty-four hours, who try to fit all of the sights and sounds and women of the city into their single day on shore. But the story is relatively unimportant, all things considered: the real draw are the song and dance numbers, and the film fittingly won the Academy Award for Best Score. The undeniable highlight of the film, “New York, New York,” is simply a delight to watch. Kelly co-directs the film along with Stanley Donen (the frequent collaborator who also worked with Kelly on Singin’ in the Rain) and choreographed all of the dance numbers, and the performances bear the hallmark of his athletic, gracefully powerful style of dance. It’s in this film that Kelly first dabbles with inserting elements of modern dance into the routines, an approach that would reach its pinnacle just three years later in the marvelous An American in Paris. That Kelly and Donen take the action outside the studio and into the streets of the real New York also adds much to the film; had the movie been filmed primarily on a soundstage, it would not have nearly the same impact. The film will also air on April 13th at 6AM EST, so if you miss it today, you can catch it then. The film is also available on DVD, and quite cheaply through TCM (Movies Unlimited is on FI-YAH this month). And Carrie will hopefully be able to post a review of the Kelly-Sinatra box set that she recently received as a gift, so you can determine if it’s worth your dime to just go ahead and gather up all three (hint: it is)!